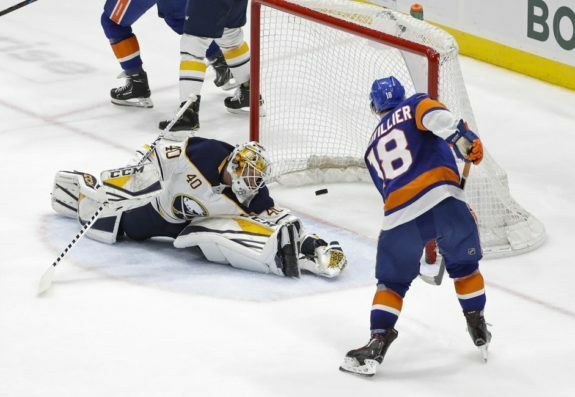 UNIONDALE, N.Y. — Jordan Eberle continued his scoring surge with another goal, Anthony Beauvillier added two of his own and the New York Islanders clinched a playoff berth for the first time since 2016 with a 5-1 victory over the Buffalo Sabres on Saturday night. Michael Dal Colle and Ryan Pulock also scored for the Islanders, who have 99 points in their first season under coach Barry Trotz and secured a post-season spot in March for the first time since 1990. If the Islanders finish first or second in the Metropolitan Division, it would mark the first time since 1988 they would open a playoff series at home. The Islanders came out flying against the dreadful Sabres, outshooting Buffalo 16-8 in the first period. Hutton managed to stop Beauvillier on a penalty shot at 12:23 after defenceman Brandon Montour tripped the Islanders forward. NOTES: The Islanders are 12-6-2 at Nassau Coliseum this season and were also 12-6-2 at Barclays Center in Brooklyn. … The Islanders are 32-14-3 in their last 48 games and 7-2-2 in their past 11 games overall against the Sabres. … The Islanders scratched defencemen Thomas Hickey and Luca Sbisa, plus forwards Tanner Fritz and Ross Johnston. … Buffalo scratched defencemen Zach Bogosian, Matt Tennyson, Jake McCabe, Matt Hunwick and Rasmus Ristolainen, plus forwards Evan Rodrigues and Vladimir Sobotka.